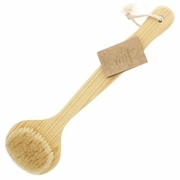 Cedar Bath Brush Boar Bristle 13"
Home > Health and Beauty > Cedar Bath Brush Boar Bristle 13"
The Japanese know that you don't just bathe to get clean - you do it to stimulate circulation and good health. After all, your skin is your largest organ, and this traditional Japanese style 100% boar-bristle bath brush will make it sing! This size is a perfect whole-body brush. 13 inch.